Recently, I went to the Genius Bar at the Apple Store near my house with my laptop. It reminded me of just how far I have come in regards to technology in a few short years. It is hard to believe that I lived a half century on this planet before becoming versed in sending and receiving email! In 2005, my oldest, David, set up a Hotmail account for me and taught me how to do email. 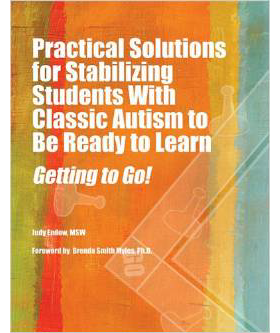 I had read an autism book and wanted to email the author. In a few months I had a few more people to email. It snow balled. Today email is my main source of communication with most others and I receive over 200 emails most days! This is no small feat because computers are hard for me even though I now use a computer most of my waking hours for one purpose or another. Because of my sensory differences I have learned to dim the brightness of the screen. Additionally, I need to do my computer work in a particular way. Too much scrolling makes me nauseous and even though I am able to click the mouse at lightening speed I refrain from doing so as a rapid successions of changes to the appearance of the screen causes a dizzy, spinning feeling in my body. I get a lot accomplished every day using my computer, but do so with a steady rhythm and pace. I also use lots of ink cartridges for my printer because I print out rather than scroll through most documents. It takes a bit of figuring out, but I have a system down that serves me well. Shortly after becoming comfortable with email I asked my oldest son to pick out one new thing to show me online. He showed me how to use Google. I began looking up info on all sorts of things. I discovered Google images! It has some similarities to the way my brain works popping up images in relationship to word input. Whoever constructed that system must understand how an autistic mind works! 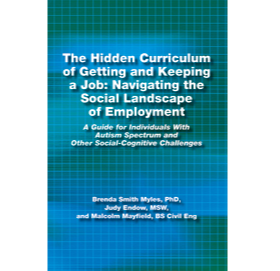 In 2006 my first book,Making Lemonade, Hints for Autism’s Helpers, was published. I was getting invited to speak and wanted to learn how to make the pictures that speakers put up on screens for their audience to see. I asked around, found out this was called Power Point and googled “how to make power points.” That is how it happened that in 2006 my first book was published and my first power point was constructed. I still use that power point today even though I have learned ever so much more about power points since that time. I do not especially like talking on the phone. My children all had cell phones, but it was not something I especially wanted for myself. As my business picked up I found myself out of town more often. My youngest was a senior in high school and I wanted to be able to check in with him when he got home from school and I was out of town. I wound up getting a cell phone. In fact, my son Daniel and I got the very same cell phones on a family talk plan. He had his phone all set up with all his friend’s names and numbers programed before I even had the instruction book read. Daniel uses his cell phone for many other things such as an alarm clock, to play games, to take pictures and he has his phone set up to ring differently depending on who is calling him. This was beyond me at the time. It was enough for me to use my first cell phone simply to call someone. In fact, I didn’t even like using a cell phone, but did so out of necessity. 2006 was a big year for change in my life. My youngest son went off to college. This necessitated another technology change in my life. I sent the family computer of to college with Daniel and got a new laptop for myself. I needed a laptop because of presenting, but just hated learning new technology. Even so, I discovered some really nice things about a laptop. First of all, the lighting behind the screen is much different than on a desktop computer! This increased my efficiency drastically! It enables me to use a computer for many hours at a time rather than 30-45 minutes before needing a break. Because I do not get reliable sensory feedback through my fingertips, it is very inefficient for me to use the scroll pad on my laptop. Instead, I must use a mouse. My business expanded. I needed to be able to keep on while on the go. Once again, technology was the answer. In the summer of 2009 I got a Blackberry. It took me two weeks to read the instruction book and figure it out. Each day I forced myself to do something with my Blackberry so I could become used to using it. In 2013 I got an iPhone and it didn’t even come with an instruction book! Today I use it for email, social media, to take pictures, play games and to talk on the phone. A really great thing about the camera feature is that I can take pictures with ease because it does not jolt my sensory system in the way that cameras with flashes do. I have learned to use both my iPhone and my laptop for many things. I learned to use Facebook as a way to keep in touch with my children. Today it has become a tool for keeping up with many in the autism community. Imagine a person with autism who has had difficulty making friends all her life now having over 4000 Facebook friends from around the world! I post many autism related articles on my Facebook page. Be sure to send me a friend request if we are not yet Facebook friends! I made a new kind of Power Point to use in my presentations. I constructed automatically advancing slides using images and words on the slides and then learned how to imbed music background. 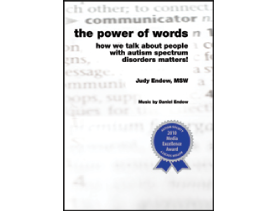 The production is called The Power of Words: How we talk about people with autism spectrum disorder matters! In 2009 it became published as a DVD (AAPC, 2009). 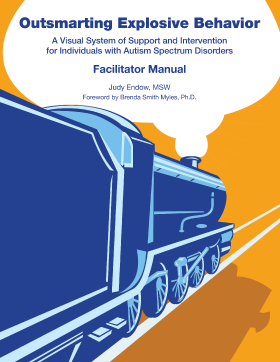 This DVD won the 2010 Mutimedia Award from Autism Society of America. In 2010 I decided I wanted to construct a web site. So I googled “how to make a web site” and read up on it. I chose a website company and started following the online instruction tutorial. 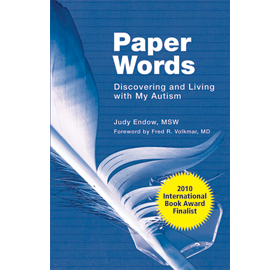 I made a five page website called www.judyendow.com. Each month I update the Calendar of Events page with my new speaking engagements and change whatever else might need to be changed. Today, this original website has morphed into something much larger and includes an Art Store with my paintings along with frequent blog postings. In 2011 I became the owner of a mac laptop! It took me several months to get used to using it and caused much anxiety. One would think with all the new technology experiences I’ve outlined that I would be able to take new technology in stride without the high anxiety. Not so. Each new technology I set out to learn poses great difficulty for me in terms of becoming familiar with it. Many people on the autism spectrum find technology to be their friend. Not me. Most difficulty is due to the scrolling screen technology. It makes me physically sick to my stomach and I become too dizzy to be able to have the balance required to walk across the room. This is very unfortunate because it means I am missing out on some technology that could potentially be helpful to me. I am also grateful because it narrows down the scope of new technology I need to learn. 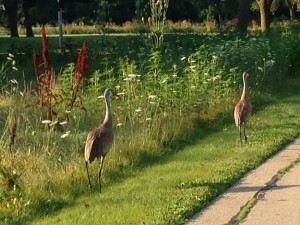 Even though I can listen on a conference call and sometimes talk, they are difficult for me. As a board member of Autism National Committee I have learned to use a group chat feature online that is used for board meetings. Nobody talks. It levels the playing field because some in our group can’t talk. In my work with Autistic Global Initiative (AGI) I have learned to use both individual and group Skype on my new mac. The group Skype allows me to see each person. Some of us talk and some of us type using the chat feature. It works well in terms of not having too much speaking going on. All of us in AGI are on the spectrum and between us have a wide range and variance of communication challenges. The group Skype and Go To Meeting sorts of technology have been quite helpful. Nearly everyone I know is better at technology than I am. But that is okay. I know how to make appointments at the Genius Bar! In conclusion, I have in a few short years learned so many new techy things I have decided that for me personally, my 50’s will be deemed “The Decade of Technology!” Some new things I want to learn before I turn 60 include producing webinars and You Tube clips. Good thing I have a few years left – plenty of time! 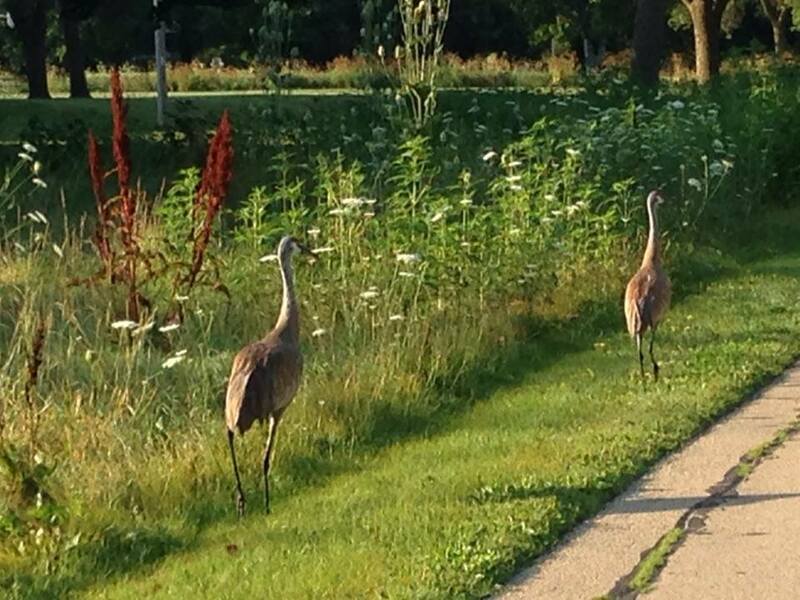 while out for my early morning walk today! Endow, J. (2006). 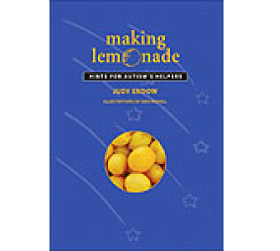 Making Lemonade: Hints for Autism’s Helpers. Cambridge, WI: Cambridge Book Review Press. Endow, J. (2009). 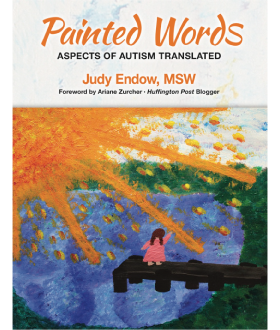 The Power of Words: How we talk about people with autism spectrum disorders matters! Shawnee Mission, KS: AAPC Publishing.